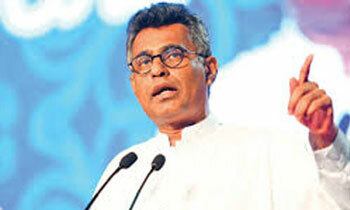 While claiming that the Cabinet reshuffle was not a solution to the political crisis in the country, Minister Patali Champika Ranawaka said today an action plan to address political, social and economic problems of the people was the need of the hour. “What we need is a certain action plan to address people’s aspirations within a certain time frame. We are not satisfied with a change of Cabinet. There should be an immediate action plan to resolve burning issues such as the issues of the people hit by the drought,” he said. He told a news conference organised by the Jathika Hela Urumaya (JHU) that all forces that participated in setting up the “Good Governance” government in January, 2015 should be re-united to fulfil the promises made to the people. Mr. Ranawaka said the government should take steps to address shortcoming of the government such as the delay in taking action against the wrong-doers and the disappointment caused to the people due to this. “We are of the opinion that some crucial political reforms are necessary for this. The first thing is to formulate an action plan agreeable to both factions of the government and implement it. The action plan to be fulfilled within next three months and within 18 months should be identified and it should be turned into the programme to address people’s burning issues such as drinking water, drought, fertilizer issue and a proper programme to provide the Samurdhi allowance,” he said. it was a rude wake up call isnt it minister? Acting against corruption certainly should not be selected against a few. For example a close associate of this minister was found in the leaked Panama papers. Did an inquiry take place? Nope. From Mr Ranawaka's comments, it seems that Big Coup is brewing within the cabinet and he is willing to jump the sinking ship. So, why didn't you spell out your solution for the last 3 years? Where were you hiding it? You are also in the same band wagon right?